I bought an iPad 2 this year, more than anything, as a media consumption device. The tablet’s beautiful screen seemed perfect for watching Netflix in bed and browsing the web while on the couch. With print journalism on the ropes as news on the web continues to catch information consumers, it seemed smart to see what the tablet could do to transform media – as well as how big news corporations were using the iPad to deliver a new experience to readers. But the more I used the iPad, it became clear that it’s more than just a device to transform the way the news is consumed, it’s a step forward in the way news is gathered and published. While I wouldn’t advise ditching the ol’ reliable desktop yet, it’s possible for a journalist to thrive using an iPad. Here are 10 basic apps that will lead reporters through the process of gathering, creating and promoting stories. A vision of the future is a good place to start. 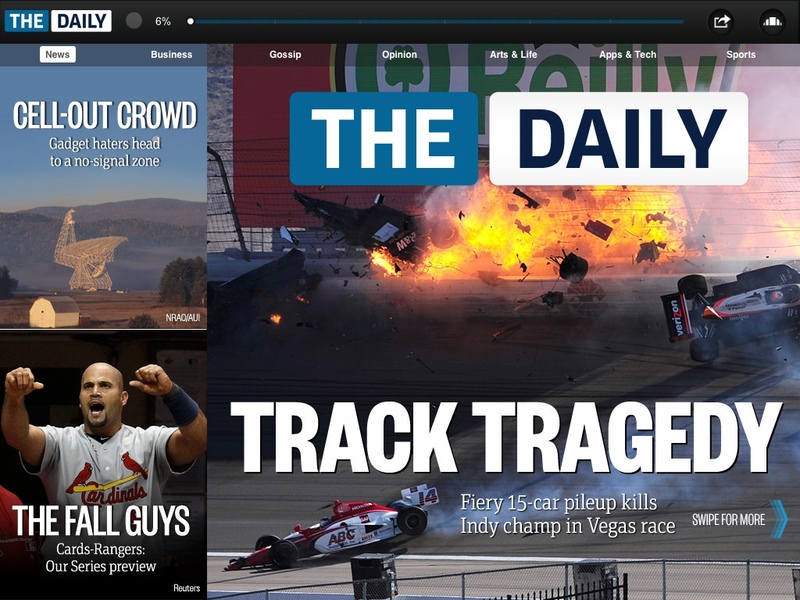 The Daily, which began publishing solely on the iPad on Feb. 2, 2011, is worth subscribing to. Owned by News Corporation – the second largest news conglomerate in the world – the “paper” has significant resources behind it to experiment with embedding TV news stories, graphics designed specifically for the iPad and often strikingly designed pages using plenty of pictures. It’s also worth checking out the iPad apps developed by a number of media sources to get a sense of where some apps succeed and where they fail. I read a number of them, including CBC, Globe and Mail and several Postmedia papers. This Apple-designed app is arguably the most powerful and elegant word processor available in the app store. Sometimes a writer just needs a pleasant place to do his or her typing, and Pages fits that bill. It can be used for writing and for a bit of design work. One of the shortfalls is the omission of folders to sort your work, which becomes more and more of a nuisance as your body of work builds. But that’s a small price to pay for the aesthetics. 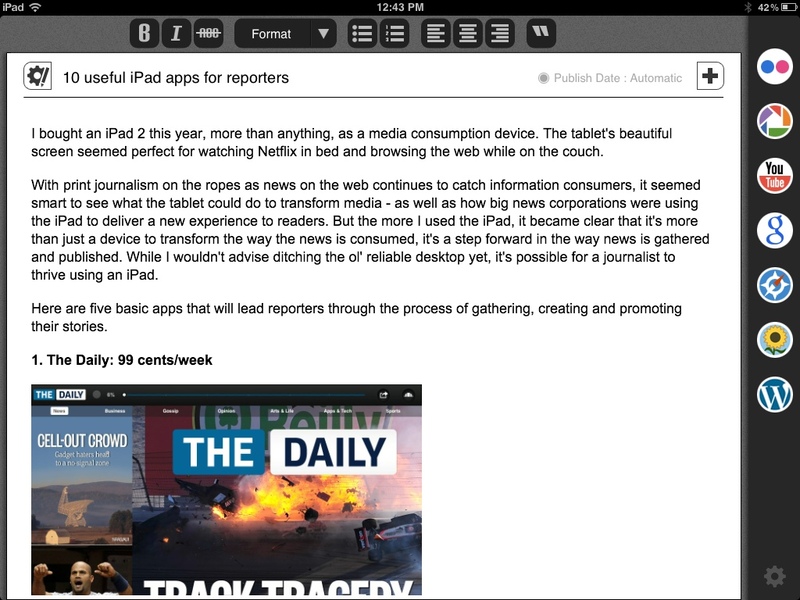 Pages also features a useful undo button (since there’s no Apple-Z command on the iPad). There’s also a full-screen view option for those who like to look at a blank page. Want to turn your talk into text? 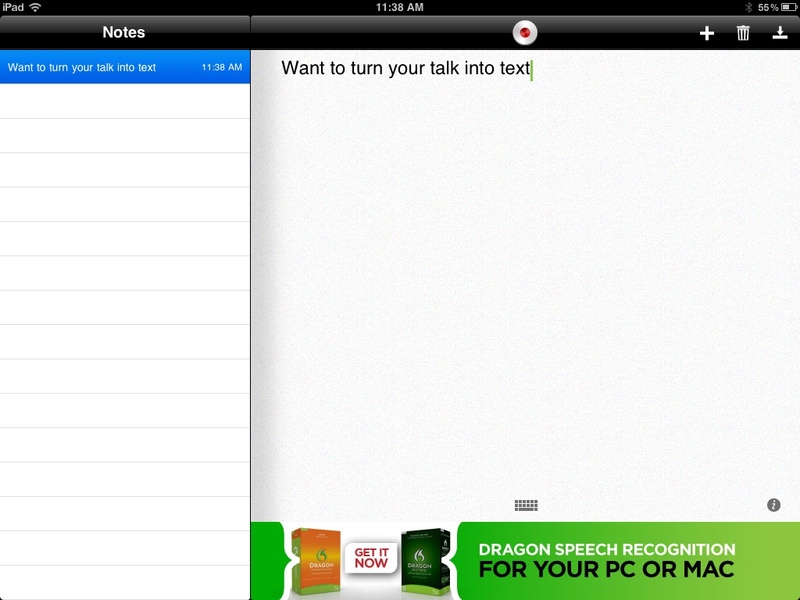 Voice recognition software certainly isn’t perfect, but Dragon Dictation is one of the best available. 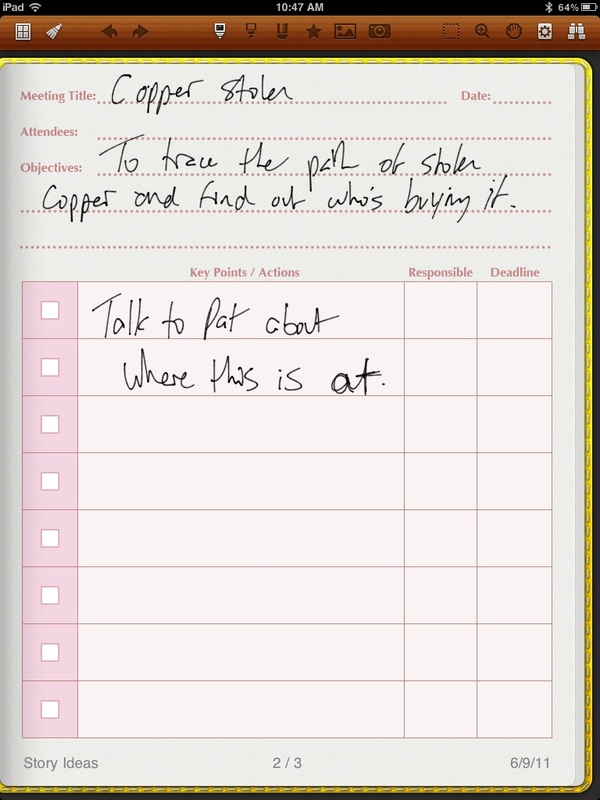 The app can turn your recorded interview into text. Granted, you will have a lot of cleaning up to do because Dragon is apt to flub words. So beware because it may turn “prime minister” into “brine munster” and “political scandal” into “pool hall sandals.” Good thing the world has copy editors. When news breaks, you’d better be on top of it. When a source asks you questions about a current event, you’d better know what he or she is talking about. So you already (obviously) have an RSS feed set up on Google Reader, right? 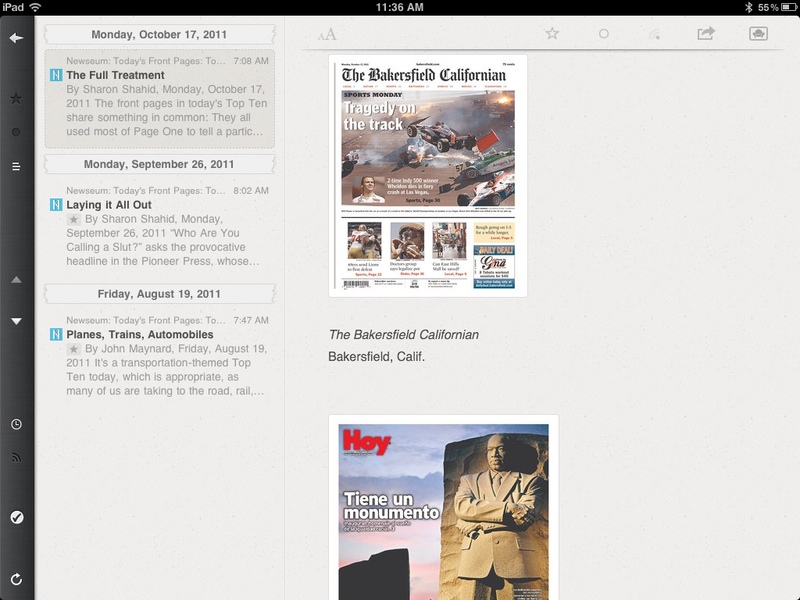 Reeder takes that feed and brings it to the iPad in a beautiful and useful way. And you can Tweet and post links to Facebook from the app. 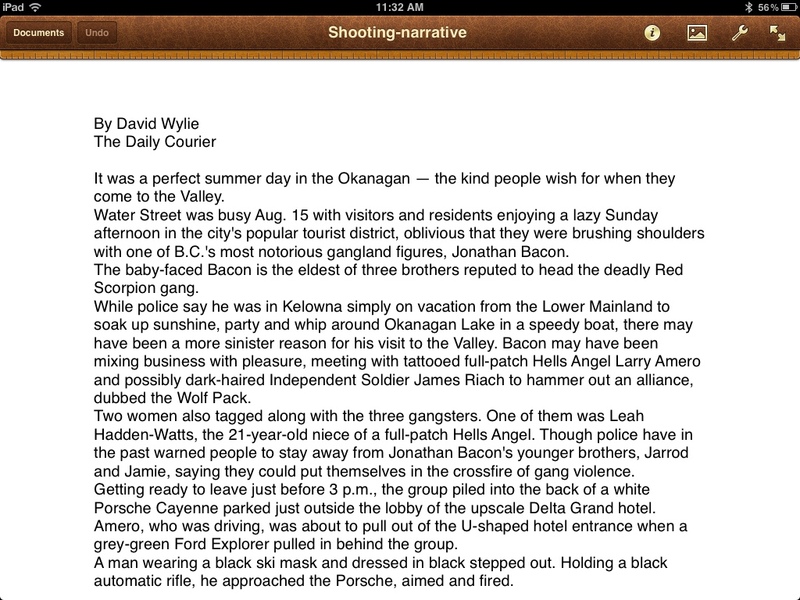 For those who are truly adventurous and want to see whether they can also drop their notepad, Noteshelf is one of the best handwriting apps on the market. The app’s menu is a bookshelf where users can store a library of different types on books. So you could have a reporter’s notepad, a calendar for upcoming events and a book of story ideas. It’s a bit slower to take notes with the app than with a notepad, and it takes a bit of getting used to. You’ll also want to buy a stylus, which can cost about $12. As the web grows in news prominence, employers like to see that prospective employees are comfortable working across multiple platforms, including blogging and social media. Experience posting to the web is a valuable asset. For freelancers, a blog is even more essential. It’s a way of getting your name out there, of showcasing your work and finding more clients. While WordPress on Safari is basically unusable and its app is cumbersome, Blogsy provides a clean spot to type and a simple way to grab and embed images and video. In fact, this column was created entirely in Blogsy. Most national journalists, and many local ones, are now using Twitter to promote their work and engage in discussion with readers and with each other. It’s a good way to keep on top of breaking events and to gauge what’s trending. 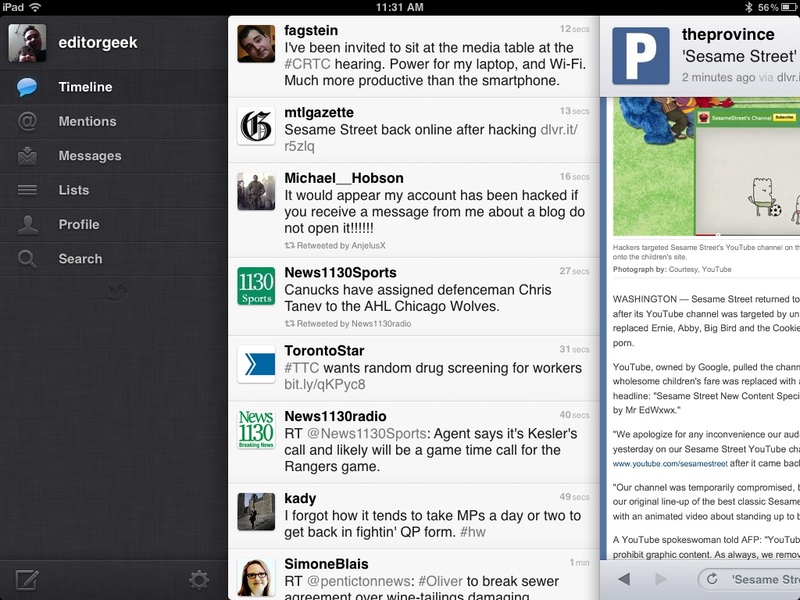 While there are a slew of Twitter apps, the app created by Twitter itself is more than sufficient – and it’s free. There are a few ways to get photos onto your iPad other than using the device’s underwhelming camera. You can use an iPhone as your portable camera and easily sync with the iPad using an app called PhotoSync, or you could buy an iPad-compatible card reader to upload photos from a digital camera. 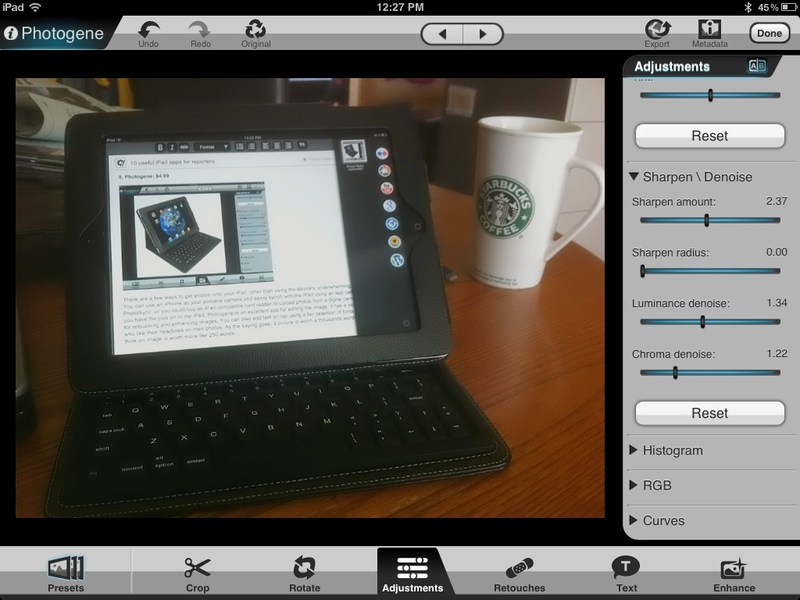 Once you have the pics on to the iPad, Photogene is an excellent app for editing images. It has a variety of tools for retouching and enhancing images. You can also add text on top using a fair selection of fonts – for those who like their headlines or cutlines on their photos. As the saying goes, a picture is worth a thousands words; though I think an image is worth more like 250 words. 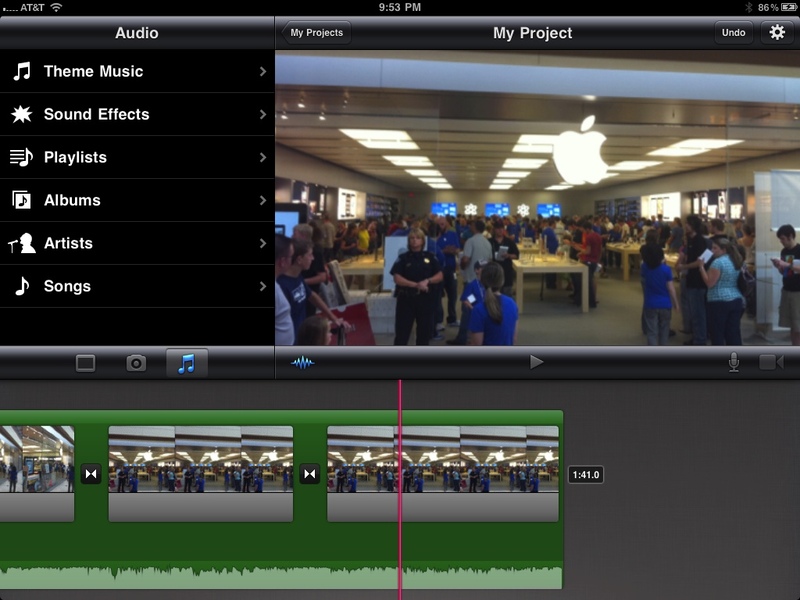 For the very well-rounded journalist, who’s also interested in shooting video and producing a TV-style news story, iMovie is a versatile option. As an Apple-created app, it’s stable and easy to learn. You can splice video together as well as add voiceovers and text – everything needed to create a decent video package. 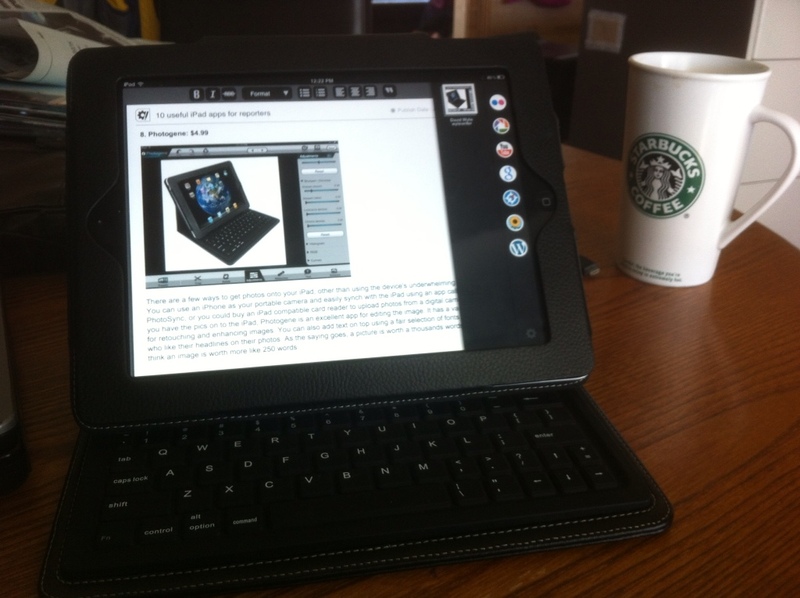 Sorry Apple, but the touchscreen keyboard just doesn’t cut it for writers. Thankfully, the clever folks who invent products realized that the iPad needed something to help us scribes. While this isn’t an app, this list seemed incomplete without mentioning a keyboard attachment. There are a bunch of them easily available online or in Future Shop, where I got the Kensington keyboard case that I use. If you’re serious about using the iPad as a tool in your journalism toolbox, a keyboard case or compatible keyboard is a worthy investment.